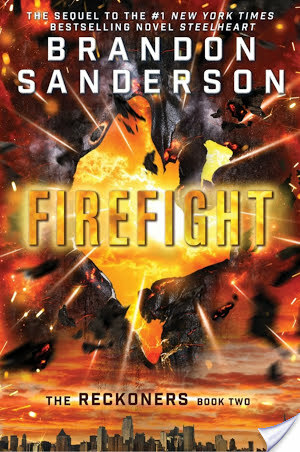 Brandon Sanderson, the #1 New York Times bestselling author of Words of Radiance, coauthor of Robert Jordan�s Wheel of Time series, and creator of the internationally bestselling Mistborn Trilogy, presents the second book in the Reckoners series: Firefight, the sequel to the #1 bestseller Steelheart.�� Newcago is free.�� They told David it was impossible, that even the Reckoners had never killed a High Epic. Yet Steelheart--invincible, immortal, unconquerable--is dead. And he died by David's hand.�� Eliminating Steelheart was supposed to make life simpler. Instead, it only made David realize he has questions. Big ones. And no one in Newcago can give him answers.�� Babylon Restored, the city formerly known as the borough of Manhattan, has possibilities, though. Ruled by the mysterious High Epic Regalia, Babylon Restored is flooded and miserable, but David is sure it's the path that will lead him to what he needs to find. Entering a city oppressed by a High Epic despot is risky, but David's willing to take the gamble. Because killing Steelheart left a hole in David's heart. A hole where his thirst for vengeance once lived. Somehow, he filled that hole with another Epic--Firefight. And now he will go on a quest darker and even more dangerous than the fight against Steelheart to find her, and to get his answers.From the Hardcover edition. YOU NEED POWER TO BE AN EPIC. Enter for your chance to win a Mophie portable charger to power up while reading Brandon Sanderson�s Steelheart and Firefight. Check out an excerpt of FIREFIGHT here. BRANDON SANDERSON is the author of the internationally bestselling Mistborn trilogy. In 2007, he was chosen to complete Robert Jordan’s The Wheel of Time series following the author�s death.� The concluding book in that series, A Memory of Light, was released on January 8, 2013, and debuted at #1 on the New York Times Hardcover Fiction List., just as his two previous Wheel of Time books had done.� His work has been published in over 25 languages and his books have sold millions of copies worldwide. He lives and writes in Utah. Visit him at BrandonSanderson.com or connect with him on Twitter @BrandSanderson. My favorite super hero is any and all of the xmen, namely Gene but only when she bugs out and becomes PHOENIX since she can rip your molecules apart. That counts right? Brittany T recently posted..GIF TAG! My favorite superhero is Batman right now, since I just watched The Dark Knight Rises today, hehe. I’ve always enjoyed the adventures of The Flash although I haven’t gotten into the new TV series yet. Thanks. Crystal Allen recently posted..Calling all Fort Worth Photog Moms! Oh man, that’s hard. I’m actually a really big fan of the Marvel Comics Universe. I am currently really loving Hawkeye and Ms. Marvel. They are just really awesome. Wonder Twins! Loved watching the Saturday morning cartoons as a kid. I can’t just pick one so I’ll go with my two favorite, Captian America and Superman!